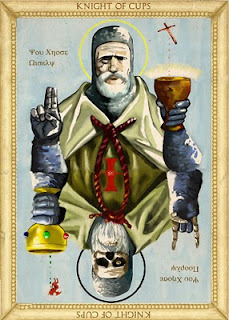 The next iteration in the Tarot courts are the Knights. Again, there are a couple different ways to interpret the Knight cards- again, they can refer to a state of being, or a specific person. The people the Knights indicate are those in a state of change- perhaps neither fish nor fowl, but in the pond nonetheless. The Knights can be an indication of motion and change, and movement towards some end. The Knights have something interesting in common- they are often shown riding something- usually a horse, but some means of conveyance, equine, fantastical or otherwise. This too is an aspect of the Knights, as they indicate first, change- things being in a transitive state, moving towards some development and greater degree of stability, and second, knowledge and mastery. 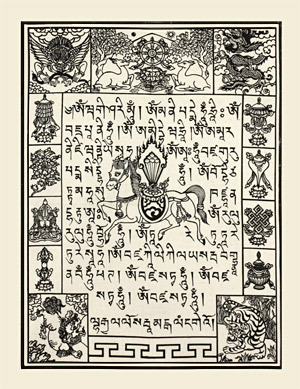 Whereas the Pages were indicative of new mastery, we have the "next level" shown here- the Knights are masters of their mounts, indicating a greater degree of knowledge and control over their own lives- and knowledge and control come from understanding. So, to see a Knight in a reading indicates either a transition state, or alternately movement, either literal or metaphorical, in one's life. The Knights have as their element in common Air, and Air is an element of movement and communication. Actually, we know that Air is present by the fact that it moves- we know the wind not by direct perception, but rather by perception of its effects. We know sound not by direct perception as well, but by its vibrations in the air. Though subtle, Air is about communication, and is in motion on the molecular level- whereas Earth is also in motion, the interesting thing is, the greater the motion, the more fluid and changing the element is. First, let's consider the Knight of Wands- that is, Air of Fire. Recently someone pointed out to me that this Knight actually does appear to be on fire! The plume on his helmet looks like a big flame, and it appears fire is coming from the joints of his armor. This Knight looks to be pretty well in command of his horse, perhaps even showing off a little bit. All these things are aspects of this particular Knight. Fire and Air combine here to provide an almost boundless source of energy- however, fire also requires fuel, and this Knight may tend to jump from idea to idea, embracing each one and abandoning it just as quickly. However, this Knight will also seek out challenges and new opportunities, as these too will fuel his need to compete and to win. So, as we can see, this Knight knows how to get where he wants to be, and will seek out those challenges. However, this can be trouble down the road, if not applied or sent in productive directions. This is also a trend among the suit of Wands- they are tremendously charismatic and energetic, but need to keep their energy under scrutiny sometimes, as they can get caught up in less than wise decisions, and this is especially true for the Knight. As a message of travel or change, it's a time of transition and increased energy, and things will be taking off for the better, but rapidly and towards a definite end. It's a message of riding an exciting and dynamic wave of change into the next stage of life. Next, we have the Knight of Swords- Air of Air. I chose this image from the Crowley-Thoth deck, mainly because it expresses the transitional nature of the Knights, and the intellectual keen edge (pun not intended) of the Swords suit. The Knight is, like Air, restless and always in motion, jumping from idea to idea, and full of energy. This Knight will usually be moving from idea to idea, and every point in between, perhaps even arguing for the sake of argument, and delighting in the challenge. The Knight is very cerebral, and sometimes suffers from a lack of contact with the real world, instead being lost in his own mind and his own idealized world. However, when the Knight turns that acute intellect outwards, he can sometimes cause trouble, or reveal things that the other people might not want to see. As a message of change, the change will be rapid and fast-moving, not unlike air- things change and move quickly, and there may be a sense of restlessness and movement in a very rapid sense. However, at the same time, this can result in uncertainty, considering too many alternatives and weighing each one- seeing both the good and bad in each potential choice can lead to stagnation and indecision, even in a time when decisive action is called for. 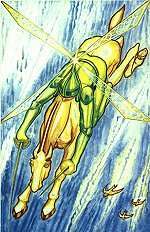 Here we have two very fluid elements- Air and Water, and the combination of them can be one of extremes- the Knight as a person tends towards emotional extremes, and may at times be carried away by these emotions, and may tend towards egotism and self-centeredness at his worst. However, the Knight, like all the Knights, being highly idealistic, also has a tremendous capacity for loyalty and love, and will remain very loyal to those he cares about. This Knight, being so emotional by nature, can conversely also be a bit of a thrill- seeker, which can lead to trouble, especially in terms of abusing drugs or alcohol- obviously, this isn't a guarantee, but a possibility with this person. The Knight more than any other also tends towards daydreaming, and this is not a bad thing in and of itself, except when this Knight becomes so wrapped up in their internal world that it's at the cost of actually seeing the world around them, and losing touch with it. 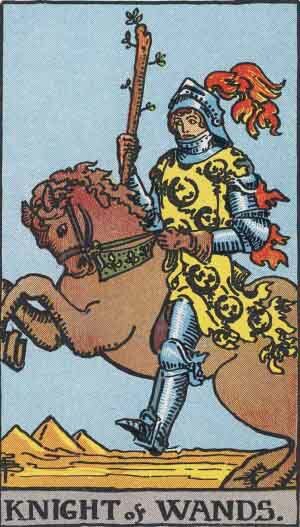 As change, the Knight represents change of an emotional nature- if this card appears, it could be tied to a relationship or romance, perhaps someone's feelings revealed or understood, and becoming clearer as time goes on. These changes can also be drastic, and subject to rapid change- a time of emotional upheaval. 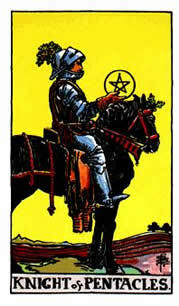 Finally, on to the Knight of Pentacles- Air of Earth. Here we have a similar figure to the Page of Pentacles- seeming to hold the symbol of his suit carefully, wondering what can be done with it, and already formulating ideas in his mind as to how to do that. However, the difference here is a sense of direction and purpose- whereas the Page was standing, the Knight is mounted on a horse, indicating movement towards a goal and purpose. As a person, this Knight is again Air of Earth- perhaps a rather odd combination, as the Knights tend more towards volatility and change, and Earth is the most stable and unchanging of the elements. The Knight, like all other Knights, is loyal and capable of great devotion and consistency. However, the Knight tends to be self-conscious and does not like to be the center of attention, tending towards solitude and perhaps isolation. This Knight is perfectly content to wait patiently and work out his plans for the future, usually focusing on his material successes, but can also in this way be too focused on his own ends, shunning the companionship of others. It is a common trend among the Knights to be overly idealistic, and in this way to be prone to lose touch with the real world, imagining the world in their own black and white terms rather than any shades of gray. This too can lead him to a state of inertia, staying in the same place until some physical concern causes him to change, then lapsing back into the same state of contented inertia. In terms of change, this change will be slower than perhaps the person would like, and gradual- very un-Knight like, some might say. However, the Knight represents gradual and lasting change, and the need to put aside impatience and be patient is here. So as we can see, both the Pages and the Knights represent change- whereas the Pages represented the first spark of creativity and change, the Knights represent the next step in that change, or alternately in human life. Here we have the movement from potential- not yet to complete realization of an idea, but directing energy and effort towards a more clearly understood and defined goal.